Mullan Village has been added to the 2012 Irish Photo Rally Map. 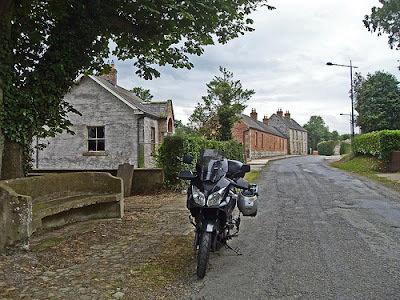 Motor cyclists from near and far have been meandering their way to Mullan this year to capture their bike in the village. The original Irish photo rally was run in 1975 by Eamon Morrissey from Limerick. The idea originated God knows where but there have been photo rallies in other countries (Scotland in the late 70’s). Eamonn ceased running the event after one year &Andy Deane – then based in Dublin, now in Cork - ran one or two in the mid to late 70’s. The Boyne Riders, a motorcycle club based in north Leinster ran the Photo Rally from the late 70’ to the mid 80’s. They then ceased to be an active club but the former members remained close friends. Lorcan Green & Gerry Christie, over a few pints in 2002, decided to revive the event for 2003 & use the Boyne Riders name. They ran the event as before on a 32 county basis but lumped the inland counties together - they can be dull compared to the coastal counties. Dublin & Louth were the exception, they are paired off because there are small counties & some numerical provincial balance was required. There are 24 locations &a close provincial balance - there are only 5 counties in Connaught so Leinster gets one extra anyway (7). All the participants have to do is submit a photo of the location with their bike in it. A formal presentation is held in early Feb each year where badges & special awards are handed out; the final formal act of the presentation night is the release the current year’s list. The list is ideally an eclectic mix of out of the way places & quirky or interesting things; it is really designed to help people overcome inertia, to give them an excuse to get up off the couch & do a bit of biking & to find hidden bits of Ireland.